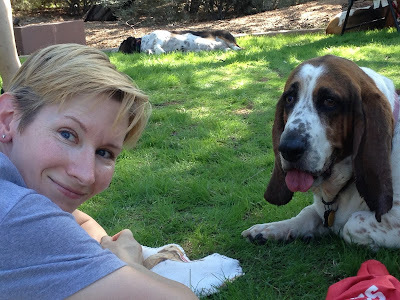 I’m Ruth Carter – lawyer and writer in Phoenix, AZ and the loving dog parent to Rosie, the 8 year-old basset hound. 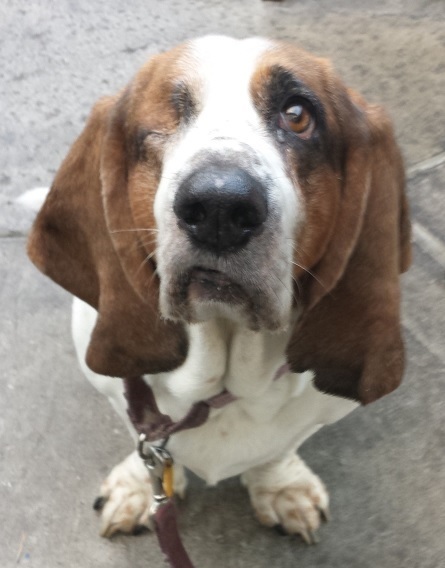 She was diagnosed with glaucoma and lost an eye in 2015. This was our last picture together before her diagnosis. She will eventually go blind. I want to give her the best life possible, including letting her see as much as she can while she still can. Rosie and I spent a long weekend in Flagstaff, AZ. We rented an Airbnb at a house owned by two artists. It was a great place to get away to relax and recharge. We loved the pellet stove. We started and ended each day in front of the fire. Our Airbnb had a kitchenette with a coffeemaker and mini-fridge that was stocked with coffee and cream. I don’t know what brand it was, but it was delightful. Any goodies to go with the coffee? I made myself oatmeal with brown sugar, chopped almonds, raisins, and almond milk. How were you and Rosie united? 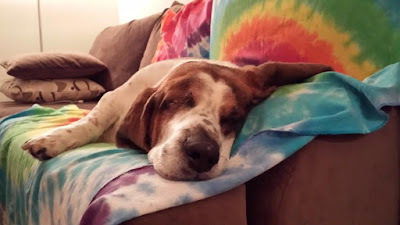 I adopted Rosie from the Arizona Basset Hound Rescue when she was 4. We just celebrated 4 years together. I knew the moment I saw her at our meet-and-greet that she was my dog. Any treats for Rosie on this occasion? She just finished her breakfast kibble and chopped baked chicken. She slept on the couch next to me while I finished my breakfast. How did Rosie get her name? Does she have any nicknames? Rosie’s original name was “Roxy.” When I saw her sweet face and her big brown eyes, I knew she was really “Rosie.” It took her less than a week to adjust to her new name. Her full name is Rose Louise Carter. Louise was my grandmother’s middle name. No toys today, though she’s a fan of sticks. Sticks are the only chew toys that stand a chance with her. 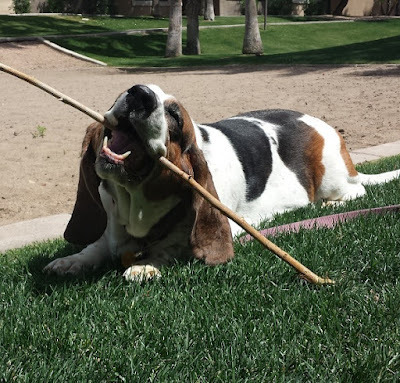 No “long-lasting” chew toy has last more than 10 minutes with her, but actual sticks stand a chance. She loves to break them into pieces. When she finds a stick during one our walks, she proudly trots home with it in her mouth, her wagging tail waving triumphantly upright. Who is Rosie's best pet-pal? We live in a great neighborhood with lots of dogs. Her best pal is a 12 year-old German shepherd named Zavvy. They enjoy the mellow life of sniffing the ground, relaxing in the grass, and occasionally playing with the whipper snapper dogs. What is Rosie's most endearing quality? She is so pure. Her eyes tell an entire story. You never have to question how she feels because it’s emanating from her. Even though she had a rough start before she was rescued, all she wants is to love and be loved. If Rosie could change one thing about Arizonans, what would it be? Make more dog-friendly places. She’s too stubborn to be trained to be a therapy dog and she likes to go with me when she can. I negotiated her into my work contract so she can come to the office where my co-workers love on her. If Hollywood made a movie about your life in which Rosie could speak, who should voice her? Shirley MacLaine! She's so much like Weezer (Ouiser Boudreaux) from Steel Magnolias. If Rosie could answer only one question in English, what would you ask her? I love you and I want you to be happy. Is there anything more I can do to make sure you know you’re loved every day? What advice would Rosie give if asked? Do what you love and enjoy the simple pleasures. And don’t be afraid to use your devastatingly charismatic eyes to get what you want. If you believe they can’t resist you, they’ll believe it too.